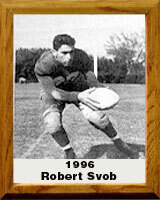 Robert S. Svob graduated with honors from Jerome (Arizona) High School in 1937 after excelling in basketball and football, including earning All-State football honors. With a gridiron scholarship in hand, he came to the University of Arizona where he played and lettered four years as halfback and fullback and received his B.A. in physical education and M.A. in administration. Robert joined the physical education staff at UA in 1942 , then entered the Navy during World War II, serving in the South Pacific. He rejoined the UA faculty in 1946. Along with his teaching responsibilities, he was director of intramural sports for 17 years. He was Commissioner of Interscholastic High School Athletics for Southern Arizona for 10 years; football, basketball and track official for many years; assistant athletic director of Intercollegiate Athletics in 1958; appointed Dean of Men in 1966; and became the UA Dean of Students in 1972. Robert served as chairman, YMCA Ranch Camp; charter member and vice president of Big Brothers of Tucson; member and board chairman, Arizona Boys Ranch; a member of the Wildcat Club and charter member of the Arizona Alumni Endowment Club. Robert has been honored by the UA Bobcat Hall of Fame, UA Athletic Hall of Fame; honorary life member of the YMCA and many other groups and organizations during his lifetime of service and dedication.